(L-R) Trish and Don Hall are recognized for their donations to LLUSPH by Dr. Helen Hopp Marshak on Thurs., Feb. 11, 2016. Don Hall graduated from Loma Linda University in 1973 with an MPH in nutrition and a DrPH in preventive health care in 1978. 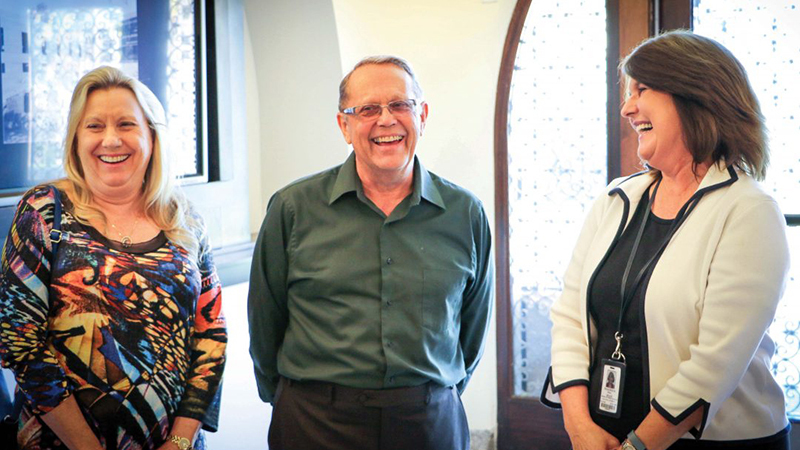 Dr. Hall and his wife, Trish, visited LLUSPH the week of February 11 for the unveiling of a plaque dedicated to the Halls for their contributions to the school. Dr. Hall spoke as the keynote presenter at the LLUSPH Career Fair on February 19, and Trish took part by helping with mock interviews for the students. While attending graduate school at LLUSPH, Dr. Hall founded the Loma Linda Lopers, a running club in Southern California that now has more than 1,000 members. Last year they trained nearly 500 people to run a marathon.